during the 2018 Cricket Australia Indigenous Championships on February 8, 2018 in Alice Springs, Australia. As someone who has led Notts Outlaws down the stairs from the home dressing room countless times, taking charge of a visiting side at Trent Bridge is going to be something of a strange feeling for Dan Christian come Tuesday morning. But, given the historic and unique circumstances, it’s an occasion he is relishing. For Christian will proudly captain the Cricket Australia Aboriginal XI men’s team in a T20 encounter against a Notts XI on a ground that over the last few summers he has come to call home. The fixture is part of a double header that will also see a touring women’s side from Down Under take on an England Women’s Senior Academy squad. The matches, which start at 11am (Women’s) and 3pm (Men’s), are part of a historic tour that commemorates the 150th anniversary of a male Aboriginal cricket side touring England in 1868, becoming the first sporting team from Australia to tour internationally. “It’s going to be a really special day playing at Trent Bridge,” says Christian. 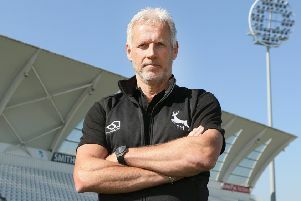 “I spoke to (Nottinghamshire Director of Cricket) Mick Newell as long as six months ago about hopefully being able to play there, and it’s worked out beautifully. “We’re very thankful to the club for putting on the game for us and it’s fantastic for the guys to be able to play at such a beautiful ground. It’s got its own unique history as a venue, and was where one of the matches was played in 1868. “I actually did a tour of England with the team previously, in 2009, but I have always been busy since, often playing for Notts, so I’ve not been able to get involved. But whenever available, I like to play as much as I can. “Once I knew I could make it for this tour, I was delighted to come, and to captain the side means a lot to me. It’s a great feather in my cap to be representing my family back home, as well as my culture. Before each match, the teams will be led out by local school children from West Bridgford Infant School (women) and Jesse Gray Primary School (men), who will carry a giant silk of commemorative artwork. It will be followed by a short ceremony, where the teams will line up and the touring Aboriginal mentor will say a few words about the significance of the occasion. The artwork – produced by the granddaughter of one of the players from 1868 – has also been incorporated into the design of a set of cricket stumps, which will be used as the middle stump at both ends for the matches. At the end of the tour, they will then be presented to the best male and best female players. During the interval between the men’s and women’s matches (scheduled to be 1.45pm to 3pm) there will be a drop-in heritage session in the Museum Room, off the Long Room, in the Pavilion. It will feature a range of heritage objects, including an original poster for the ‘Australian and English Sports’ event that concluded the three-day match 150 years ago, and all are welcome. At 2.30pm heritage volunteer, David Coy, will give a short talk about the original tour and the match at Trent Bridge against Nottingham Commercial Cricket Club. Christian added: “This is something that means a lot personally because you know what the original players sacrificed to go on that first tour, walking for seven days just to get to Melbourne and then being smuggled onto the boat to come across to England. “The biggest thing we want to do is to promote the game among indigenous people back home and give people some role models. Every other sport in Australia is full of Aboriginal players, but sadly not in cricket, and we want to change that. During their stay – which has seen the two teams play Surrey, Sussex, Derbyshire and the MCC (men only) – the players have visited a temporary display at the MCC Museum at Lords that explores the history of the 1868 tour. They have also paid their respects at the grave of all-rounder Bripumyarrimin ‘King Cole’, who passed away on the original tour. A plaque was unveiled to mark the occasion and the Australian High Commissioner read the same eulogy as was read out at the time of his burial. “I think it’s very important to know about your heritage,” notes Christian. “I’ve read about the stolen generation in the 30s, 40s, 50s and 60s when Aboriginal kids were taken away from their families, which was pretty horrible. Even my dad tells me stories of having to run and hide in the bush so he didn’t get taken away. Each of the 13 male players in the squad will proudly represent one of the pioneering tourists by displaying their name on the back of their uniform. Christian will don the name Unaarrimin, who was given the English-speaking name of Johnny Mullagh. The female squad will wear their own names on their back, being pioneers as the first female indigenous team to tour the UK, and Christian believes having teams from both sexes make the trip is a big step forward. He enthused: “It’s great that the women have been part of the tour. The Women’s Big Bash is getting bigger and bigger in Australia every year and, as a result, there are a lot more girls wanting to play cricket. “Every year there’s an indigenous cricket competition called the Imparja Cup, played at Alice Springs, and there are more and more women’s teams from different towns and tribes getting involved, which is great to see. After the tour has finished, Christian will be staying on in England ready to start his captaincy of the Notts Outlaws T20 side as they begin their defence of the Vitality Blast title, a repeat of last year’s final against the Birmingham Bears, on Wednesday 4 July at Trent Bridge. The powerful all-rounder is looking forward to the challenge as he temporarily takes over the reins from Steven Mullaney, who has skippered the side successfully in the Specsavers County Championship and the 50-over Royal London One-Day Cup. “I’m going to have a bit of time off and catch up with a few friends and then I’ll be meeting with Mooresy (Peter Moores) and Fransky (Paul Franks) to plan for this year’s Blast – and there’s a possibility I might play a warm-up game or two for the Seconds. “Mull’s done a fantastic job so far and I’ll be looking to carry that on. The guys have been used to me coming in just for that comp, so hopefully it will work well again this year. Gates for the Cricket Australia Aboriginal XIs double header on Tuesday 12 June will open at 10am and entry is free to Members and everyone who secures a ticket in advance, which must be booked online at trentbridge.co.uk/tickets or via the phone on 0115 899 0300. On the day, prices are £5 for adults and £3 for under-16s.